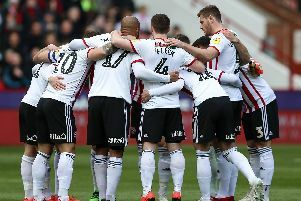 CHED Evans wants to remain a Sheffield United player when his contract expires this summer after predicting the South Yorkshire club are destined for success under manager Danny Wilson. But the Wales centre-forward, who scored twice during Saturday’s 2-1 victory over Preston North End, admitted his immediate priorities are to smash the 30 goal mark and help bring Championship football back to Bramall Lane. Evans said: “The only thing in my sights at the moment is promotion. Everything else is out of my hands but yes, I’d like to stay. “There’s no point in leaving if I’m really enjoying my football and that’s what I’m doing. “I’m scoring goals, we’re up there towards the top of the league and nothing beats it. Everyone is buzzing. “This is the best form of my career and the reason for that is because I’m enjoying myself so much. “In the past few years the style here hasn’t really accommodated me but under Danny Wilson there’s a real footballing emphasis. Evans, a £3m signing from Manchester City, described the 30-goal target as “realistic” after taking his tally for the season to 21 with a brace against North End in front of Wales manager Chris Coleman. Wilson’s appointment provoked angry scenes among some United fans when it was announced in May. But he has silenced his critics by leading United to second in the League One table ahead of this weekend’s visit to former club Sheffield Wednesday. Evans, who has blossomed since the arrival of Wilson and his assistant Frank Barlow, added: “If we went up then the manager would make us even stronger. He’d bring in the right players who would suit us.